The first pesto of basil season is like the sun coming up in the morning after a long rainy night. Bright and sparkling and fresh, and you can’t believe you lived through the long cold winter with no fresh pesto. And then your cute little basil patch turns into a forest, and you are making pesto on pesto on pesto until your family is begging for mercy. That’s when you need to get creative with the pesto. That’s when you need to make blue cheese pesto pasta. If you haven’t yet found the perfect pesto recipe, click here for my reliable favorite version from Elise at Simply Recipes. Simply Recipes is the place I go whenever I need a classic and perfect recipe for something like pesto…go browse around! Now that you have yourself some pesto, you’re going to mash it up with a little butter and a little blue cheese. A potato masher works wonderfully for this – so does a plain old fork. 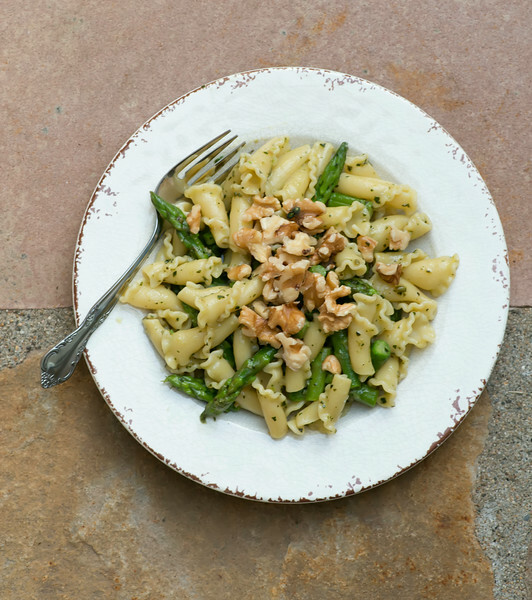 Now cook yourself up some pasta – any kind will do, but my favorite is campanelle, which has lots of nooks and crannies for the sauce to nestle into. 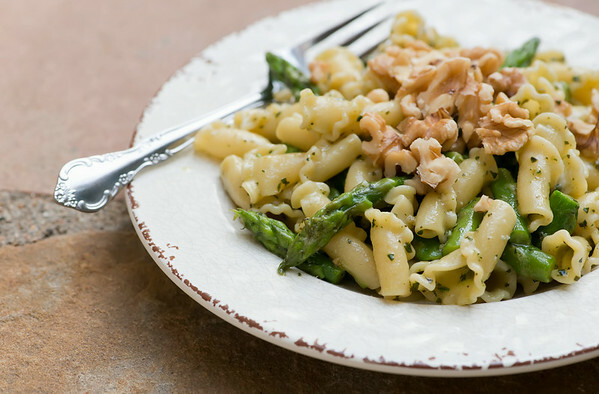 When the pasta is almost done, drop some chopped asparagus into the water so that is can cook just until it is crisp-tender. Scoop out a little of the pasta water and save it to make the sauce with. Now drain the pasta and asparagus, return it to the pot and add the pesto/blue cheese/butter mixture. Stir stir stir until everything is melted. Now drizzle in just enough pasta water to make the sauce just the right amount of loose. If you are in the mood you can scatter some chopped walnuts or toasted breadcrumbs on top – I am always in the mood for both of those things. Or you can serve it up as is. Also delicious. And just blue cheese and buttery enough for folks to be wondering what that fabulous taste is that they just…can’t…place. Cook pasta in heavily salted water according to package directions. When it has 2 minutes to go, add the asparagus. Scoop out a cup of pasta water and drain, returning pasta mixture to pot. While the pasta is cooking, mash the cheese and butter together. Mix in the pesto. Add the pesto mixture to the pasta and stir until melted. Drizzle in enough pasta water to make a light sauce. Divide among plates, garnishing with walnuts or breadcrumbs if desired. Tell nobody about the pesto part and see if they figure it out. I feel like I have paired many cheese with pesto, but never blue cheese. Kind of crazy…but i can totally see how it would work! Blue cheese is a wonderful, wonderful thing. Hi Kate, thanks for the shoutout! You are too kind. So glad you like the pesto recipe. What a great idea to pair pesto with blue cheese. Now I’m definitely curious. Thanks for the idea! My pleasure – your site is one of my all-time favorites!